April has been an exciting month for me as Benjamin Franklin. 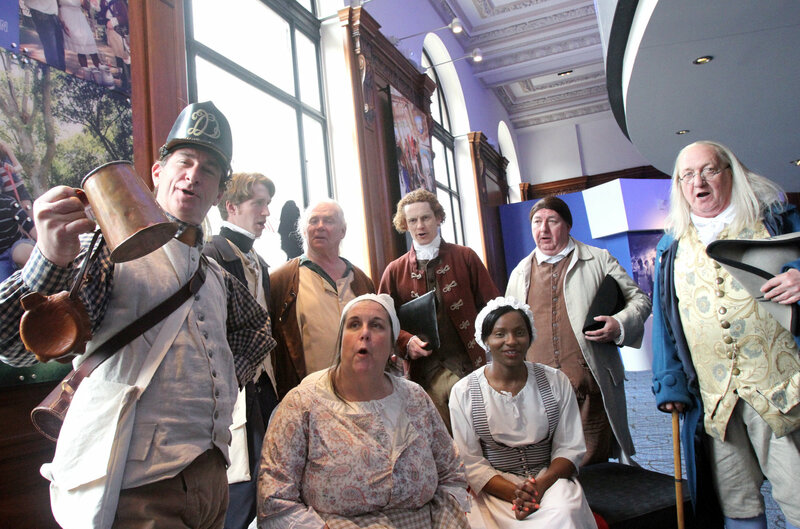 Historic Philadelphia, Inc. has staged several evenings of Independence After Hours, in which Dr. Franklin interacts with Thomas Jefferson, John Adams and others in Independence Hall. I have done a photo shoot to promote the Independence Visitor Center, and had the always delightful privilege of appearing with my good friend and valued colleague Carol Spacht for the kickoff of the Democratic National Convention activities. It was my distinct honor to speak to a conference of ambassadors and high-ranking military officers from around the world, the Strategic Services Initiative Conference. Afterward, I was able to talk with many of them during the reception, and it was one of the most intellectually stimulating evenings in recent memory. The next week, I travelled to Toronto with a delegation from the Visit Philadelphia organization. Along with the heads of Opera Philadelphia and the Barnes Foundation, along with Chef Kevin Sbraga and others, we promoted Philadelphia to a group of 75 Canadian travel writers. It was my first visit to Toronto, and what a wonderful city it is! I will go back. As we approach May, the historic area is really coming alive for the season, and I look forward to sending more news next month. As always, please send me your questions and comments, and spread the word about the newsletter.